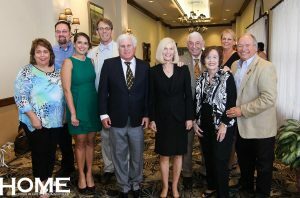 The Community Foundation of North Central Florida (CFNCF) hosted the 6th Annual Legacy Awards on Thursday, November 3rd at the Best Western Gateway Grand. The Community Foundation, in partnership with the North Central Florida Estate Planning Council, established the Legacy Awards to recognize the crucial interaction between donor, professional advisor, charity, and local corporations necessary in creating an effective and meaningful charitable gift. There are four awards honoree categories, the Corporate Award, the Nonprofit Award, the Professional Advisor Award, and the Donor Award. This year Bosshardt Realty was honored with the Corporate Award, which recognizes a company that exemplifies giving back to their community through volunteerism and charitable giving. The Bosshardt’s have been involved in many community events and organizations since Carol began Bosshardt Realty Services, LLC nearly 30 years ago. In more recent years they established the “Bosshardt Charitable Fund” where their Realtors and staff can donate parts of their commissions/pay check to the fund to help support charitable activities in the community. Additionally, the Bosshardts support a culture of giving and encourage volunteerism. In 2015, Bosshardt Realtors, Staff and Management logged well over 4,500 hours of community service here in Gainesville, that is an average of 12 hours a day for the entire year! Carol, Kim and Aaron Bosshardt lead by example, you can find them serving with the American Heart Association, the Children’s Home Society, the PALS Thrive program, and many other organizations throughout the year. Watch this video about why Bosshardt Realty was chosen as the Corporate Award honoree for 2016. The next honoree was The Gainesville Fisher House with the Nonprofit Award. The Non-Profit Recognition Award recognizes a leading non-profit who has demonstrated a commitment to encouraging gift planning, including bequests and other planned gifts, through exceptional program and marketing efforts. Guests learned about how the Fisher House began and heard from Karon Mixson who talked about her experience at the Fisher House while her son was in the hospital with serious war related injuries. She explained how the Fisher house brought some normalcy to her life when nothing that was happening was normal, she said “just to feel normal is a really big deal”. The Gainesville Fisher House Foundation is the result of the effort of the Veterans Services Committee of the Rotary Club of Gainesville and its members. This committee was formed to honor those citizens of Alachua County who have served and are serving in our United States Armed Forces. Seeing a great need in the Gainesville community for a Fisher House facility, the group formed the foundation. The Gainesville Fisher House Foundation is a 501(c)(3) non-profit organization that raised nearly 2.5 million to bring a Fisher House to the campus of the Malcom Randall VA Medical Center in Gainesville, Florida, which is now the busiest Fisher House, serving approximately 1,700 families in a year at 98% occupancy. Watch this video to learn more about the Gainesville Fisher House. The Professional Advisor Award went to honoree Ellen R. Gershow, of Dell Graham. The Professional Advisor Award recognizes service, expertise, and outstanding work by a Professional Advisor in helping his or her client complete a satisfying and transformative charitable gift. This category applies to Trust/Estate Attorneys, Financial/Investment Advisors, CPAs, Bankers/Trust Officers and other trained or certified practicing professionals.Ellen is a local Attorney who is committed to charitable works and is a mentor to students. Watch this video to learn more about Ellen, and her dedication to the Gainesville Community. The last, but certainly not least, award was the Donor Award that went to Barbara and Phil Emmer of Emmer Development Corp. The Donor Recognition Award is awarded to an individual, couple or family who has made a significant impact through their planned gift to a charity. This Legacy Award for Donors recognizes and honors an individual or family for their commitment to a deferred or planned gift made in support of one or more non-profit organizations or charitable causes. Special consideration is given to donors who have provided leadership and or encouragement to others, and to donors who have structured unique and innovative planned gifts that enrich the lives of people in our community. This award may be made to honor either living or deceased donors. Phil and Barbara Emmer are a living legacy, they have financially supported projects like Dance Alive, the Natural History Museum, the Reichert House, and others. They helped to build affordable homes in the Lincoln Estates area of Gainesville. Doris Edwards spoke about growing up “we had no idea that we were important enough to be moved out of the slums into an area that would add value to our lives…so well ut together that we didn’t know it was raining outside until we saw the rain coming down or saw people with umbrellas, we didn’t know it was cold outside until we saw people with coats…” Watch this video to learn more about the Emmers and why they received the donor award. Congratulations to all the 2016 Legacy Award Winners, and a special thanks to the Community Foundation of North Central Florida, President/CEO Barzella Papa, and Chairman Mitch Glaeser.